Featuring the Danish pianist and rising talent, Søren Kjærgaard, iconic drummer Andrew Cyrille and renowned bassist Ben Street, thiscross-generational trio has been hailed by international critics for their two releases Optics (ILK140CD, 2008) and Open Opus (ILK166CD,2010). Highlighting the compositional voice of Søren Kjærgaard, the three musicians challenge the traditional trio format, and their efforts inbreaking new musical grounds has brought them to the stages of festivals and venues in Denmark, Spain, Italy, Canada and the US. The third and present album Femklang is a work relying on its slow unraveling pulse to evoke a suspended, weightless sound world. Byopening and closing with The Loop – a drum cycle penned by Andrew Cyrille – Femklang suggests an overall circular feel to the music; therepetitive becomes a way of looking into the various shades of a single entity, a note, say, a chord or a cymbal stroke.The music which is primarily written by Kjærgaard explores sound and silence on equal terms, as two inseparable aspects, convergingcomposition and improvisation into an open sonic field with room for each individual voice to unfold. Femklang was recorded at the legendary Avatar Studios in New York under the auspices of sound engineer James Farber who had thethree musicians placed in one room in order to create a naturally resonating ambience. 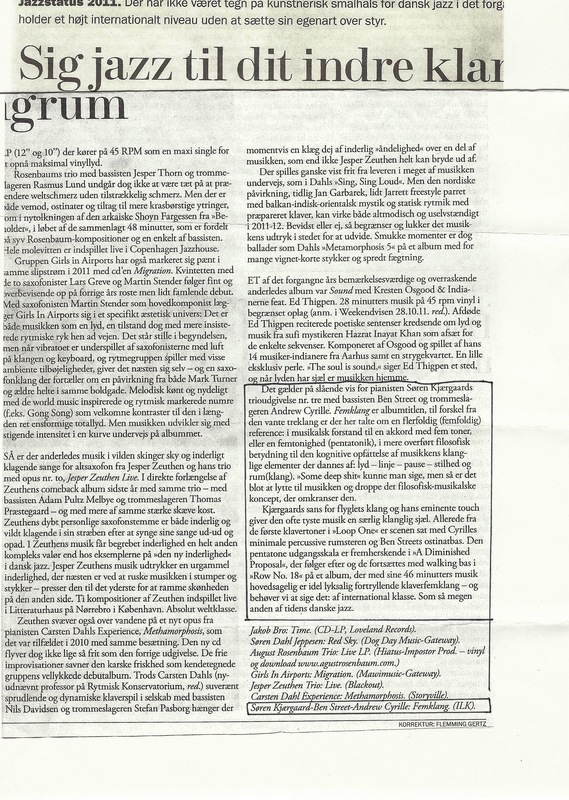 Both the sound aesthetic and the musical groundis in many ways a continuation of the two previous trio albums, and also draws a line to Kjærgaard’s duo collaboration with the poet, artist,philosopher and former tennis pro Torben Ulrich on their two releases Suddenly, Sound (ILK155CD) and Alphabet, Peaceful, Diminished(ILK167CD). Femklang is released on cd in limited edition and will also be available for download on iTunes and at other digital music vendors. The Danish word ‘femklang’ contains a variety of meanings. Femklang is put together by the two words fem, meaning five, and klang (asin German) meaning timbre or sound, according to both the sheer physicality of a sound and the individual perception of that sound: Howone hears it, aesthetically, emotionally, cognitively.In music theory, klang can refer to a group of notes, like a chord or a cluster, which also points out the most frequent use of femklang inDanish, meaning five-chord or pentachord, also suggesting five-foldedness as such. With Femklang, Kjærgaard, Street and Cyrille have reached their musical apotheosis so far, but there is no telling what the group will be able to do in the future. Their interplay radiates with the endless possibilities of art and in every effort, they seem to capture some of the elusiveness of musical creation. 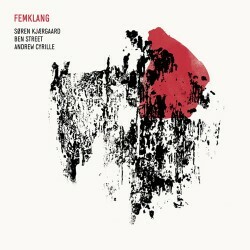 With Femklang, Kjærgaard has made yet an unavoidable trio album that will beam for a long time. Third release by this excellent, unorthodox piano trio, focusing on weightless sound world. The core and intensity is present all the time, as an invisible vibrating string which spans out between the three and manifests in a strong sense of common harmony and direction. This is what makes the trio’s third album such a strong listening experience, if only you will take your time to let the silence sound in between the notes. Kjærgaard’s sense of the piano and his brilliant touch gives the often quiet music a soulful sound. Femklang is the kind of album that can surprise you. Fascinating in its best meaning. 6/6 – Impressive jazz trio (…) Here we enter a large sonic space where every single note has an almost overwhelming value and force. … with a sense of having been on a meaningful and strongly sensed journey. … dreaming, almost casual, and yet a deeply consciuos use of a silenced expression. (5/6) … it’s first and foremost Kjærgaard’s brilliantly luminous playing that creates the decisive moments of beauty and depth on the album as a whole. (…) as on the two previous outings by this trio, the group interplay is of a very high standard.